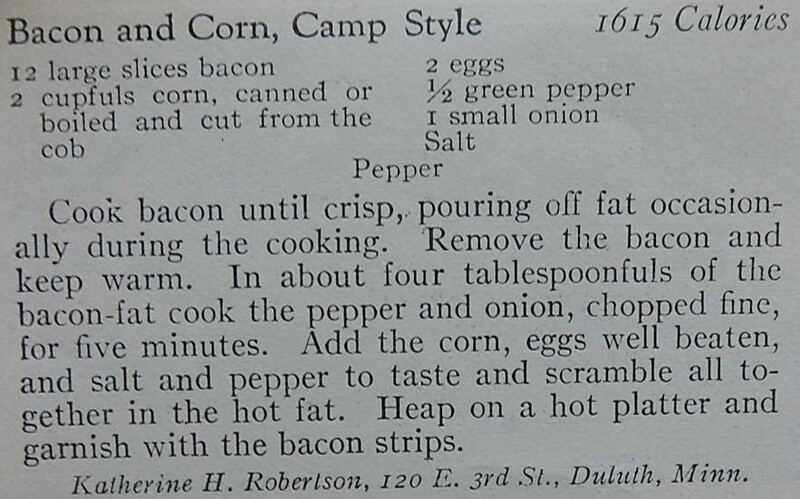 I’m always on the look-out for foods that are easy to make when camping, so I was thrilled to find a hundred-year-old recipe for Bacon and Corn, Camp Style. In addition to bacon and eggs, this dish contains eggs, green pepper, and onion, and is easy to make in a skillet. It is both hearty and tasty, and would be perfect for breakfast or dinner while camping. It also is a nice, easy dish to make at home. Using medium heat, cook bacon in a skillet until crisp. Remove bacon from pan and set aside, but keep warm. Drain most of the fat from pan, while reserving a small amount to saute the vegetables. Add the green pepper and onion, and saute until tender, about 5 minutes. Add eggs, salt, and pepper; stir to combine. Stir in the corn. Let cook until curds begin to form, then gently scrape the bottom of the pan and stir to turn the mixture to scramble the eggs. Continue cooking and scrambling until the eggs are set. Remove from the heat and serve. If desired garnish with some of the bacon strips. Serve the remaining bacon on the side. Posted on July 22, 2018 July 21, 2018 by SherylPosted in FoodTagged bacon, corn, recipe. It looks really good and hits many food groups all in one pan. This recipe does make a well-balanced one-pan meal – though probably with more fat and salt than is ideal. Love dishes like this! Although knowing me ..I make bacon bits and sprinkle it across the top or fold them in instead of strips. The strips look pretty laying across your dish. I really like your suggestion of sprinkling bacon bits on top instead of using the bacon strips. 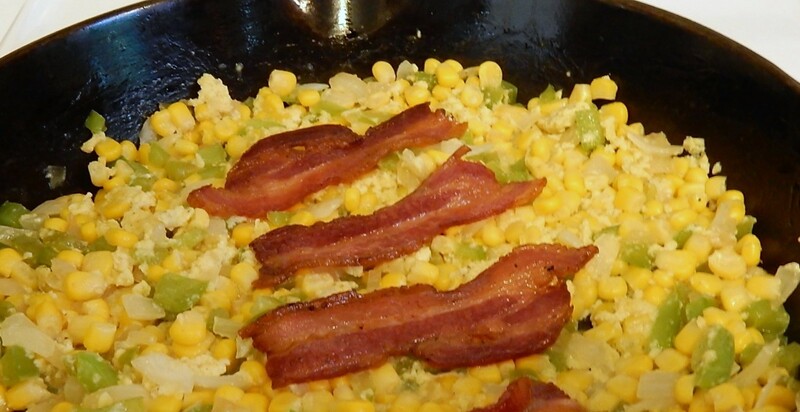 One of the things that I found most befuddling about the original recipe was how it called for 12 strips of bacon, but only 2 eggs and 2 cups of corn. Something seemed out of proportion and that there was too much bacon compared to the other ingredients. I ended up just making less bacon and garnishing with the strips as directed in the old recipe – but I think that it would look really nice with some bits of bacon sprinkled on the top. I’ll bet it smells great while cooking, too! It did – with the bacon being the predominant smell. This is an easy summer supper dish, for sure. I’ve no desire to add heat to the kitchen at this point, but nothing but salad is boring. This would be a nice change. It is a nice recipe. And, it you don’t want to add heat to the kitchen right now, you could always wait until fall to make it. Oh — I meant that this would be a nice alternative to casseroles and such. This provides a hot meal without turning the oven on! This sounds delicious and similar to my camp dishes of long ago. But I would use a can of chopped green chilis instead of the green peppers – personal preference! Can’t wait to make this, thank you for sharing! Great suggestion – I like the idea of using chopped green chilis in this recipe. Interesting that it gave the calories of the dish. I think I’m going to try this one. Good Housekeeping began listing the total number of calories in each dish in mid-1917. I assume that knowledge and technology were advancing, and that people were beginning to think about the number of calories in food. I’ve seen articles that talk about the size of a 100-calorie portion for different foods – though I’ve never seen anything from that era that talks about the number of calories in common portion sizes for various foods. Corn in eggs, mmm, sounds like a winner. Looks good too. Bacon, my favourite food group!